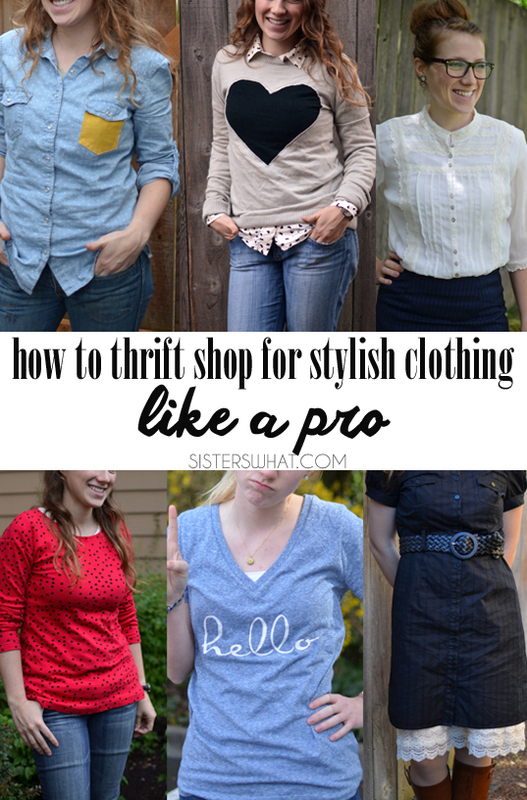 ' How to Thrift Shop for stylish Tips - Sisters, What! I grew up going thrift store shopping with my Mom, but I didn't always appreciate the experience or know how to do it so that I would actually get clothing that I wanted. Since leaving home at 18, money became tight and I started working harder at thrifting in order to have the cute clothes I wanted and still afford them. I've grown to love shopping at thrift stores for my clothes and the deals I get. I know it's not for everyone, but if you get past the fact that it was once someone else's, some many options open up. 4. The inexpense of it makes it worth the risk to refashion it. 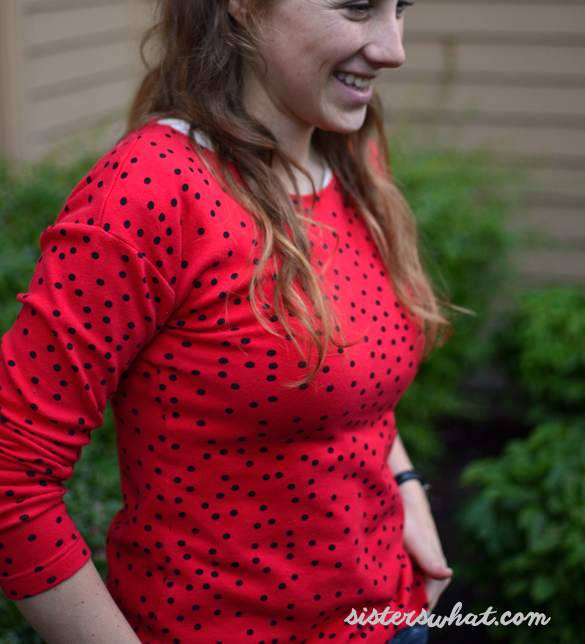 So here are some of my tips for you to arm yourself for next time you hit thrift stores. I know, sounds a little crazy to go into a thrift store with a list like your taking your weekly trip to the grocery store. But seriously, do it. It makes the trip quicker and helps you stay focused. What I typically like to do, is go to my pinterest style board and make a list of all the cute ideas that I really want. I’ll sometimes save specific pictures on my phone so I remember exactly what I want. This then helps me look for certain patterns and specific pieces of clothing. If I have those ideas in my head, I’m able to actually zone in on similar pieces of clothing. The list works for other thrifted items as well. I just always keep a list of general things I want to find at the thrift store and slowly I’ll cross stuff off over multiple trips. Most thrift stores have sales. For example, there is a nearby Salvation Army that does 50% off everything Wednesdays and it’s crazy; people line up before the store even opens. I wish I could make it at the opening, but with 3 kiddos, not even possible. But I hate going any other day because I know I can get it on Wednesday for half the price. Most thrift stores have a specific color tag sale. Know those sales days. It makes it even better to save more on those days. This is kind of a hard one for me and it rarely happens with little kiddos always in tow. Especially since the special sale days happen during the week. But, goes without saying, shopping without kids or a husband is SO much easier and relaxing. Haha, then again, if I do have any of said people in tow, I definitely hurry which can help with buying too much. However, with kiddos, it’s really hard to throw yourself into the search for clothing (especially if you want to use the changing room). When browsing the clothing racks, look for patterns that stand out to you. Ignore brands. It’s so tempting to find a name brand and want to buy it but do you really love it? Also it goes both ways, if you find something you love but the brand isn’t great the quality might not be great either. So after you find that shirt with that awesome pattern, check the quality next. Is the material thin? Are there any holes? Does it look really worn? It’s not worth buying something only to have to throw it away after a few washes. Trust me, I’ve made that mistake many times. It’s just not worth it. But it is great when you can find great pieces of clothing that are still in excellent condition and something you love. So just keep your eye out. 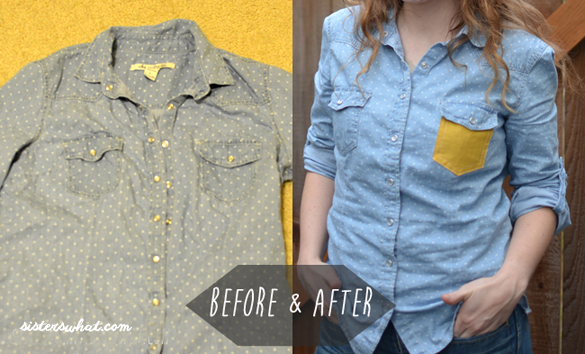 If you have any sewing skills (beginner is perfect), you an refashion many great pieces of clothing. Sometimes I find a shirt or a dress that has a really great pattern, but the dress is not cute or the shirt is WAY too big. But I don’t let that stop me. You can make a dress into a skirt or bring down an oversized shirt. In fact, I prefer to shop in the larger size section and even the men’s section. It opens up so many more options because I know I can refit any larger top to fit me. 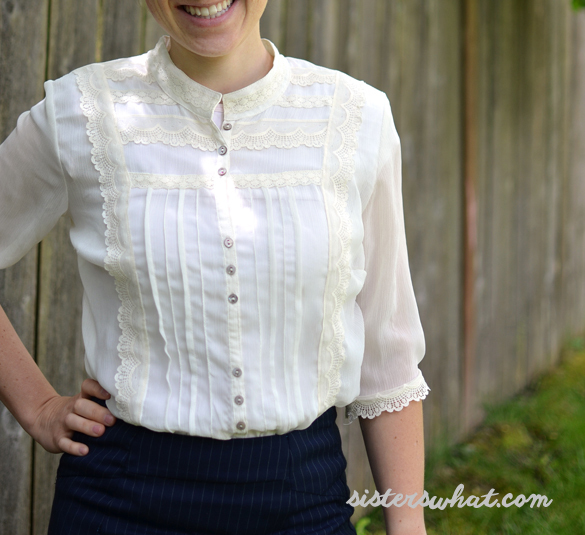 If you’re not so sure about refashioning, just go on pinterest and search refashioned clothing and you’ll find so many inspirational tutorials that are easy for anyone to do. 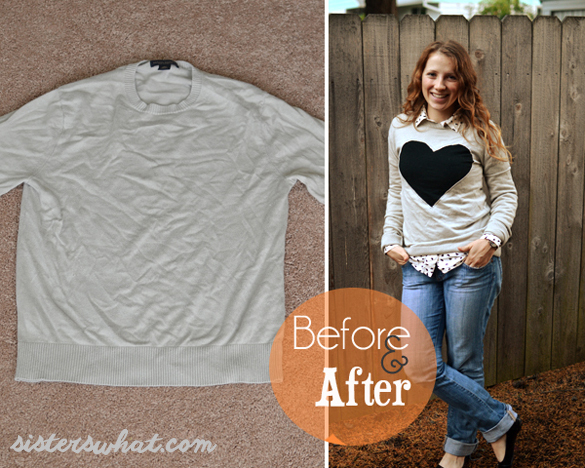 You can check out my own tutorial for refashioning any shirt or sweatshirt. Seriously, I think anyone can do it. Also, if a dress is too short, I think of ways I can make it longer. 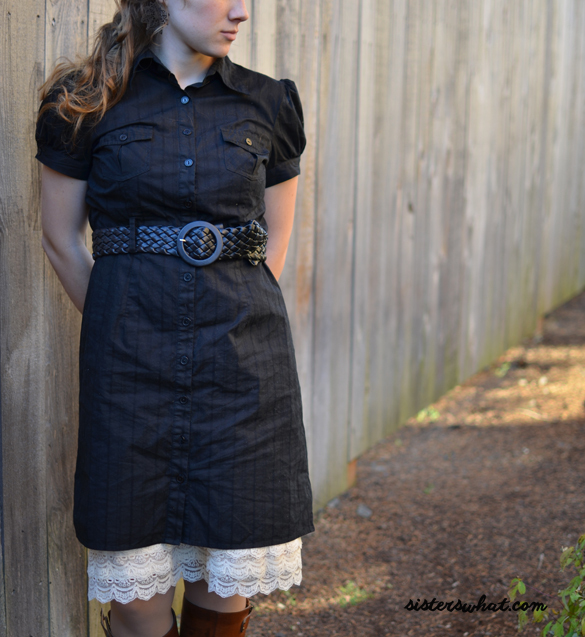 Like I made a lace skirt extender to go under a dress I found at goodwill. 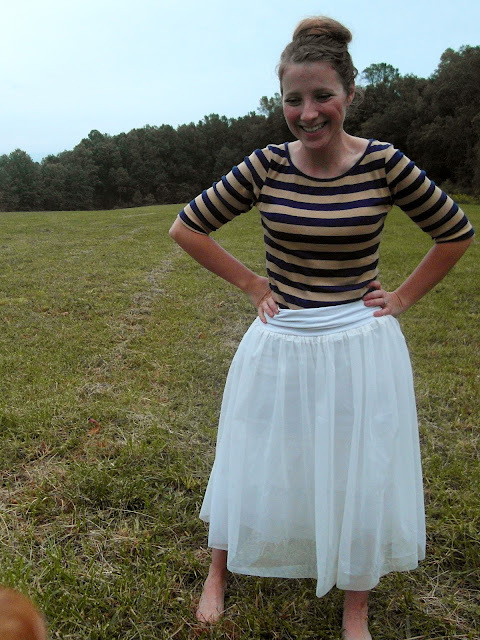 See above the skirt I made from thrift store curtains. When you are looking, really ask yourself if you really love it. Even though it’s cheap, it’s not worth it if you don’t love it. Well I hope these tips were helpful. I seriously love thrifting and the unique pieces that I’ve found.